Steve Jones guitar work throughout Never Mind the Bullocks is a power rock guitar manifesto of Herculean proportions. 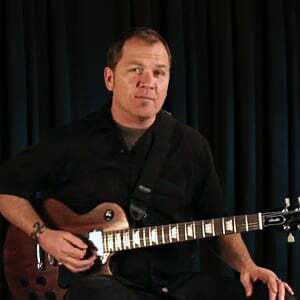 At the time, Jones' meat and potatoes approach to rock guitar sounded brash and harsh to the contemporary listener, but I believe that his playing is a brilliant blueprint for modern rock guitar. This came mostly from Jones' knowledge of rock guitar basics, combined with his ferocious rhythm playing and melodic lead playing. If you take nothing else from this tutorial, note how the guitarists we discuss here made some of the most urgent music in history by sticking to the basics. First, we'll look at the Jones-ism of sliding into a power chord from a half or whole step below on the first eighth note of a measure; this is one technique that defines his playing and is one of the signature punk riffs all guitarists should have in their arsenal. 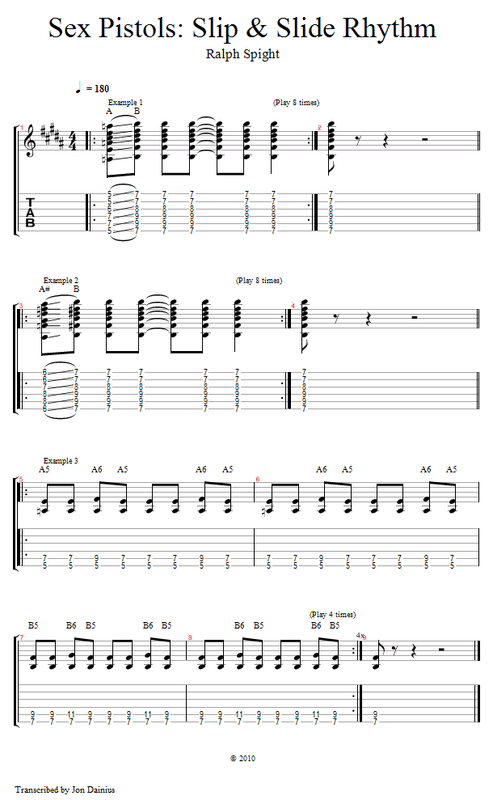 Another Steve rhythm trick is alternating the fifth and sixth in a power chord progression. This is a very basic blues lick, but in the context of a punk progression it gives a little melodic motion to the chords. First a simple chord progression without the alternating fifth and sixth. It's fine to just use the straight chords, and it may be what's indicated in any given song depending on the dynamic you're trying to create, but watch what adding the blues riff does. What we're trying to do is hit the sixth note of the scale on the 2 and 4 beats of the measure as we play straight eighth notes.